Spanish company Abengoa is planning to build a solar power plant in Chile that is designed to be able to generate electricity 24 hours and day, 7 days a week. How is this possible when the sun doesn’t shine at night? Well, the project will be a Concentrating Solar Plant (CSP), which means it will involve a form of energy storage that allows it to generate electricity through the night. The company plans to use molten salt for this purpose, as a heat transfer fluid. 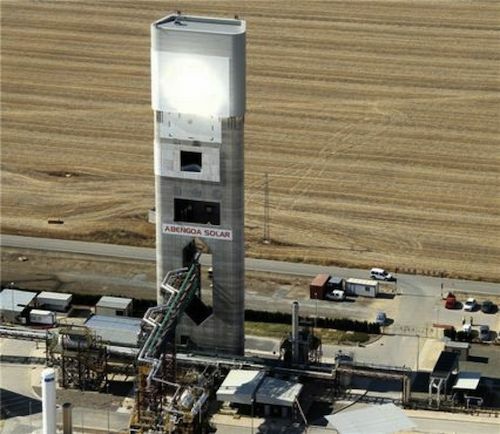 To test the technology, Abengoa has been running a demo facility in Spain for some time. If it goes ahead, the commercial project in Chile will consist of 10,600 heliostats surrounding a central tower. The heliostats concentrate the sun’s rays toward the top of the tower. The company has reportedly filed an Environmental Impact Statement with the Chilean Environmental Assessment Service, hoping to be given the go-ahead for the 110 megawatt power plant by early 2014. Construction of the project is being planned for mid 2015.